FED UP! Goes Local 2017 - FedUp! We hope that you’re able to join us and countless others in Washington D.C. this August. If you are unable to attend this year’s national event in Washington, we will assist you in planning a local FED UP! International Overdose Awareness Day event in your community. The FED UP! local events are organized to unify our message to our Federal Government for a response to this epidemic. 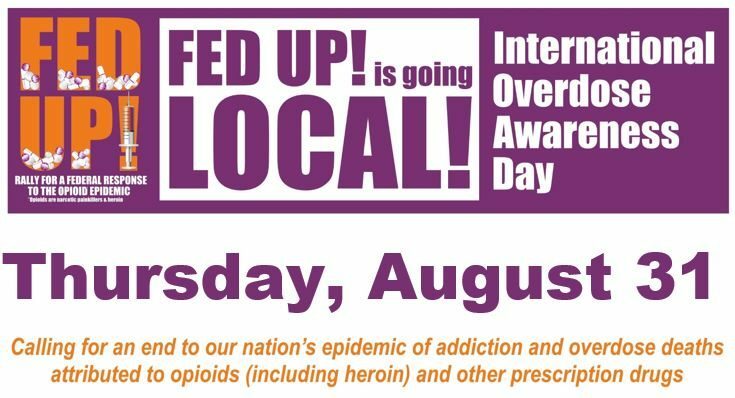 The local events should be planned to be held on International Overdose Awareness Day, Thursday, August 31, 2017. Contact Emily Walden at emily.walden@feduprally.org for more information about hosting a FED UP! International Overdose Awareness Day event in your area. Curious about our previous local rallies? Last year, FED UP! Local rallies asked Congress act to approve mandatory federal funding for treatment. There were 24 different states that had Fed Up! International Overdose Awareness Day rallies with a total of 57 rallies. On average each rally had 150 attendees honoring those lost to this epidemic and asking for a federal response. The rallies consisted of candle light vigils, naloxone trainings, walks, displays to represent the number of lives lost, speakers, and hope for recovery. The rally organizers did a great job by getting the media coverage throughout the country. Click here to read some of the press coverage of our 2016 rallies. Eager to get involved right now? This is where you can start. Like us on Facebook and add us on Twitter to stay in the loop on rally updates, helpful resources, and national news. This year marks the 5th Annual FED UP! Event in Washington D.C. This year, the FED UP! 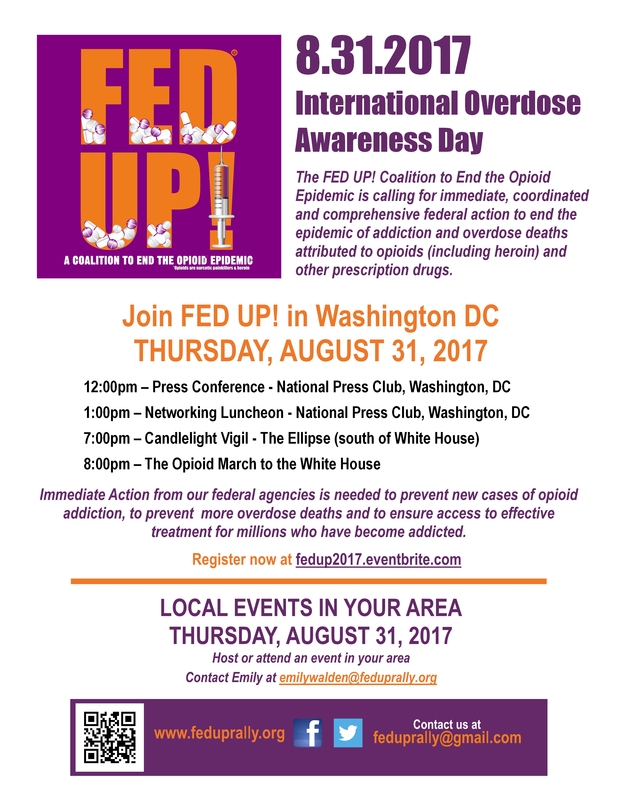 event in D.C. will be held on Thursday, August 31 in conjunction with International Overdose Awareness Day and our Local FED UP! events. We encourage you to invite your family, friends, and members of your organization to join us in Washington.